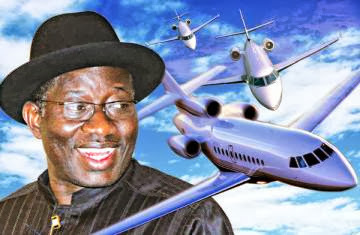 The declining fortunes of the domestic airlines have made President Goodluck Jonathan’s 10-aircraft Presidential Air Fleet larger than the fleets of three domestic airlines combined, investigations by our correspondent revealed on Tuesday. It can be technically assumed that the PAF is bigger than the four domestic airlines, according to industry experts. Aerocontractors, the second largest domestic airline, which currently has about 12 aircraft in its fleet, is struggling under sundry debts like every other domestic airline. Indications have also emerged that the 10-aircraft PAF may emerge the second largest domestic airline in the country after Arik Air, which currently has about 23 aircraft. Aviation sources revealed, however, that unless the plan to turn Aerocontractors Airlines into a national carrier worked out, the declining fortunes of the debt-ridden airline might force it lose some of its planes to foreign aircraft leasing companies as it happened to Air Nigeria some years ago. Top aviation officials admitted that the large size of the PAF could not be justified amid the dearth of aircraft among the domestic airlines, which lack adequate finance to buy more planes to meet up with the soaring passenger capacity. Apart from Arik and Aerocontractors, each of the remaining domestic airlines does not possess half of the number of aircraft in the PAF, according to findings by our correspondent. IRS Airlines has only one operational aircraft in its fleet; while Dana Air has five aircraft, in addition to those owned by Chanchangi, Medview and FirstNation, according to figures obtained from the industry. According to findings, the PAF include two Falcon 7X jets, two Falcon 900 jets, a Gulfstream 550, one Boeing 737 BBJ (Nigerian Air Force 001 or Eagle One), and a Gulfstream IVSP. Each of the Falcon 7X jets was purchased in 2010 at a cost of $51.1m, while the Gulfstream 550 costs $53.3m. The factory price of the other aircraft in the fleet could not be obtained online. However, airline CEOs put the average price of the Falcon 900 at $35m; Gulfstream IVSP, $40m; Gulfstream V, $45m; Boeing 737 BBJ, $58m; Cessna Citation, $7m; and Hawker Siddley 125-800, $15m. This brings a combined estimated value of the PAF to $390.5m (N60.53bn). Nigeria happens to be one of the few countries in the world with a large PAF. Most major countries in Europe and Asia maintain two aircraft in their PAF, according to Wikipedia. According to the online portal, Japan maintains only two Boeing 747-400 planes in its PAF. The two aircraft, mostly for the prime minister, the emperor and his wife, and other members of the Imperial Family, is operated by the Japan Air Self-Defence Force. Wikipedia also states that the Netherlands government operates only two aircraft, a Fokker 70 and Gulfstream IV to transport the Dutch Royal family and government officials such as the prime minister and other ministers. They are also used for international conferences and for private trips by the Queen and the Prince of Orange. For long haul trips, the Royal Dutch Airline is used. Often the upper deck of a Boeing 747 is used. The Queen of England and the Prime Minister, David Cameron, often go on British Airways chartered flights for long trips. Cameron was recently criticised by the UK media for chartering a foreign plane instead of a British. According to industry experts, airlines spend between 15 and 20 per cent of the cost of an aircraft on its operation yearly. They say that averagely, a little less than one-fifth of the cost of the plane is spent every year on insurance, flight and cabin crew, maintenance, fuelling, catering and training. Going by the fact that at least 15 per cent of this amount is spent annually on operating the PAF, it means about $58.57m (N9.08bn ) is being spent annually on running the planes in the Nigerian PAF. Some airline CEOs, who pleaded anonymity, had raised concerns over the economic sense behind the large mix of brands of aircraft in the PAF. They said although the fleet size was large, the cost of operation would have been cheaper if the Presidency had maintained only two brands. According to the Nigerian Air Force’s website, the PAF’s current staff strength consists of 47 NAF officers, 173 airmen/airwomen and 96 technical and administrative civilians.